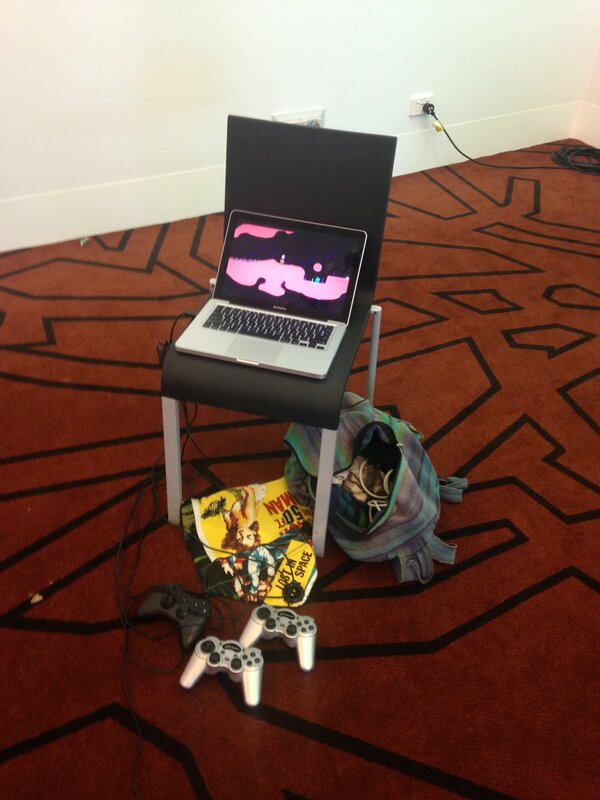 just a lil bump to remind that Kieryn's currently showing Muddledash off at GCAP Melbourne, today's your last day to nab him and give the game a go if you're nearby! tweet at us if you wanna hang out in general, as he'll be there for a while. some sweet updates coming soon! 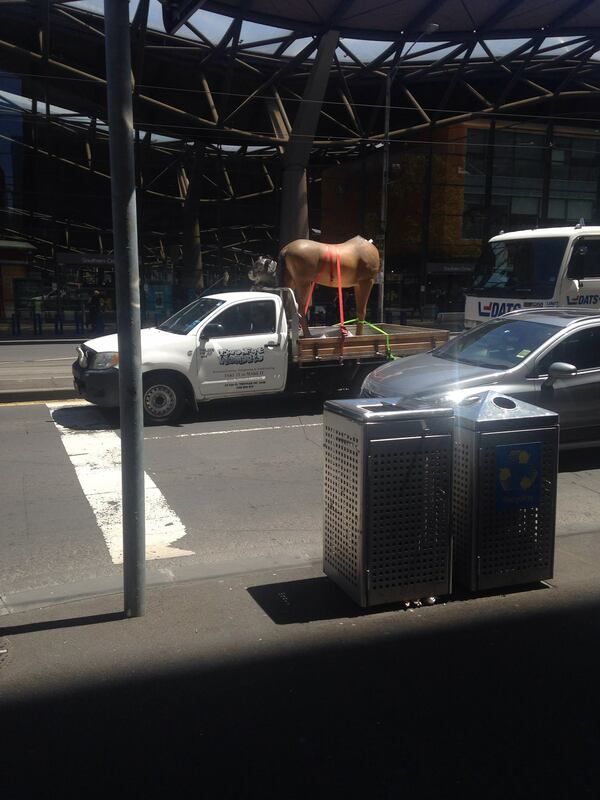 Home today after an insane 4 days in Melbourne. Missing it already but at the same time, glad to be back filled with inspiration, motivation and new ideas. I'll be treating this post as more of a diary of my time there so if you're interested in the perspective of a new developer being totally in awe of the gaming community and the vibe surrounding it please read on! I'll start off by back tracking a little bit. About a month ago while browsing through Facebook I saw a post from one of the organisers of GCAP offering a chance for new developers to apply for something called GCAP Assist. The program basically allowed successful applicants to attend the event free of charge. I applied and immediately started scouting out other events in my area, optimistically hoping that if successful I should at least have some experience showing the game to people. 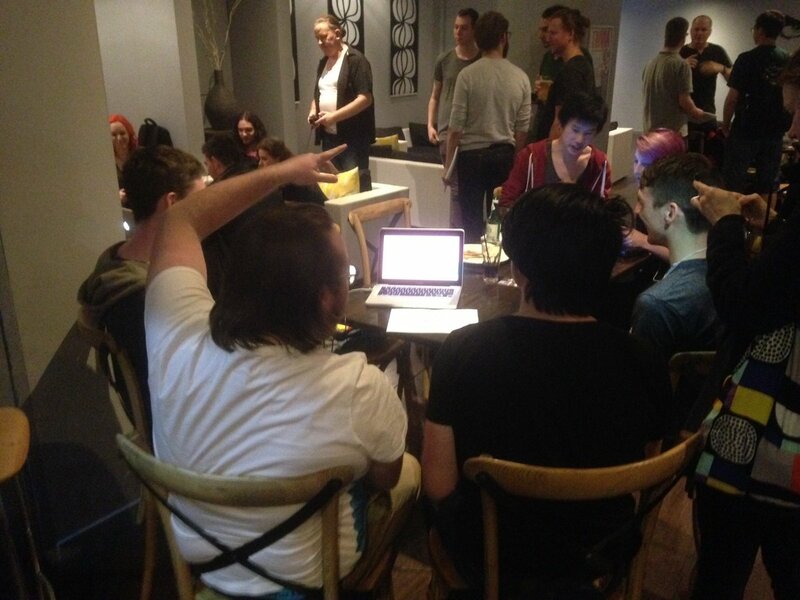 Sydney has an event every month called Beer and Pixels where local developers bring their games to a bar in the CBD and show off what they've been working on. If you've read our devlog before you'll know that I'm a big fan of this event, it's a great place to meet local developers and get a new perspective on your game. Niall and I have been working hard to get a demo build ready that we can leave alone and let people play without any explanation. From the start we've wanted our core gameplay loop to be something that people can jump right into and start playing without confusion, it is afterall meant to be a party game that anyone can play and the new build went really well! If you're not participating in your local game dev scene you should be! Playtesting in places like this is absolutely invaluable. While nothing totally game breaking, the amount of new bugs and issues I saw with the game while watching people play was staggering. People were exploring the mechanics and levels in ways I never would have thought of and without showing the game these bugs might have gone completely unnoticed. So, a few bug fixes and re-worked rooms later and I was showing the game at AIE's game day. Another Sydney based event at a game development college. After these events I felt so much better about taking our game to a conference like GCAP. The improvements made just by showing the game and gaining that new perspective boosted my confidence a lot. 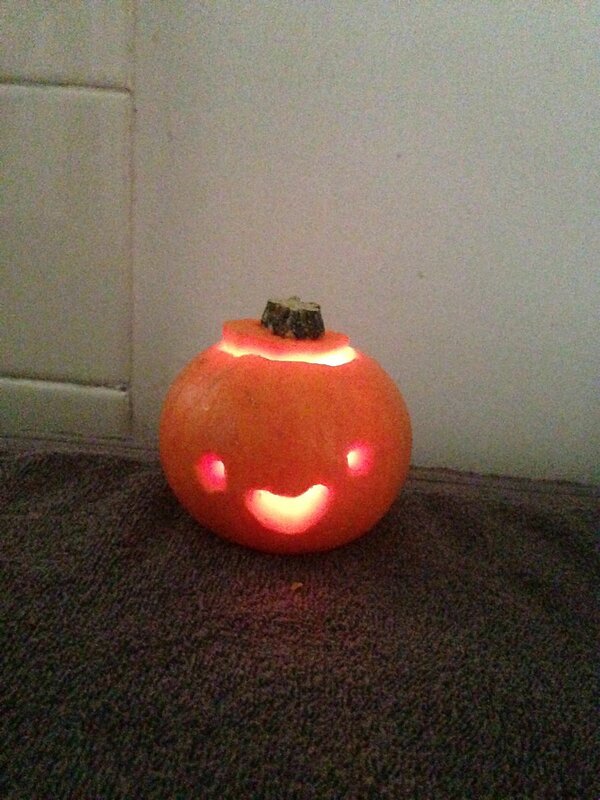 It was also nearing Halloween at this point so I carved a mini podepumkin. Soon after this I got confirmation that I had been successful in my application to GCAP Assist and I was off to Melbourne! I arrived with the new build on my laptop on the Monday morning and headed down to the conference hall so that I had an idea of where I had to go the next day. I had somehow completely missed the memo that Unite Con was on that day, the conference hall was packed! 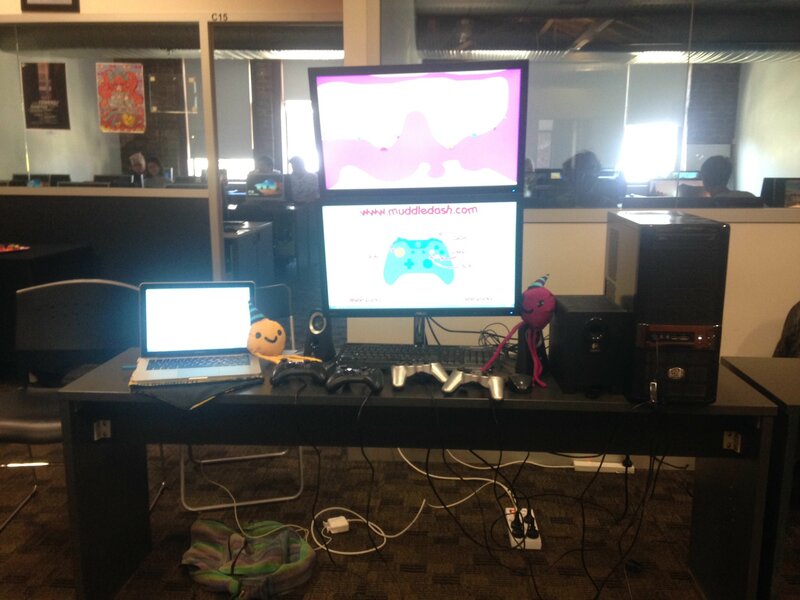 I decided, at the risk of getting kicked out, to set up Muddledash. Thankfully everyone was really cool with me setting up like this, it looked absolutely hilarious in comparison to everyone elses set ups. A lot of people there were showing what they had brought for PAX AUS so their tables looked amazing. That night there was an after party in a pub across from the conference hall, the vaporwave was blasting and I had an awesome time catching up with some devs from the Sydney scene and talking to a bunch of new people. Massive shout outs to Thom Wheeler, Julian Wilton and the guys behind Party Golf. You guys are awesome. The next day was the start of GCAP and wow. 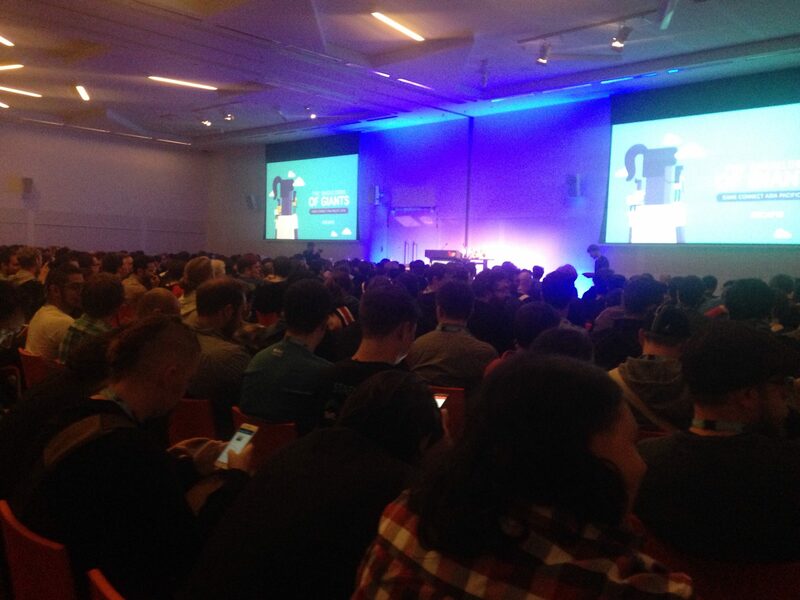 I thought Unite was big, GCAP was crazy. It was another huge day of setting up Muddledash, running in and out of some great talks and meeting a bunch of new people. By this stage I was starting to get a bit of a reputation as the guy who was setting up his game everywhere. I was super surprised that no one else was doing this. There were empty tables everywhere and great opportunities to show the game to really influential people. A lot of people came up to me purely because I was there and no one else was. If I can give one piece of advice to anyone who is new to the scene, do not be afraid to show what you have made! Everyone in the community is super nice and supportive and the worst case scenario is that a bunch of new people now know your game exists. The afterparty was another big networking event that was super enjoyable. I got talking to Laura Dale who had been flown out to Melbourne by the Victorian Government to write articles about Australian games. I saw another opportunity here and asked if she wanted to play a round of Muddledash right there in the bar and out of that we got our first bit of press about the game! You can read it here! I also had a great talk with Rami Ismail about commiting to the game you are creating and believing in your ideas. That man is a saint! The next day was a lot of the same insanity and honestly from there it is all a bit of a blur. The excitment of feeling like I am living out a dream I have had since I was 8 has totally blown me away and I'm not quite back to baseline yet. Anyways, congratulations to all the winners from the awards night and thanks to the organisers of the events. The last few days have been amazing and I can't wait to get to work. Keep an eye on this thread, there's a lot of stuff coming. Having just gone to my first major gamedev conference last month, it's great to hear your experience with it and compare lessons learned. 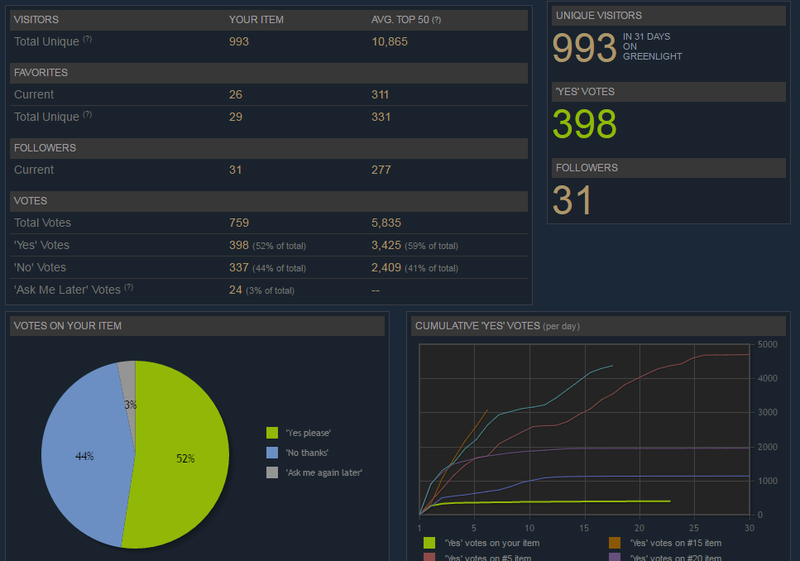 We're live on Greenlight, please chuck us a vote! it's felt like a very long time since I posted anything here, but a lot has been going on internally! I wish I'd kept track of developments more as they happen, but as in my previous update a lot of it has been under the hood. I've got the old legacy version of InControl hooked up, which enabled me to finally get some solid gameplay footage with the help of some lovely friends. I'll need to go back in and update this at a later point in time, but for now it feels great to be able to hook up a bunch of random non-standard controllers and have people play. I enjoyed the technical write up of the tentacle system. @nordanvinden thanks so much! I’m looking forward to getting into more tech posts again soon. ahoy mateys! most recently I’ve been playing with the way I handle multiple control systems. both ReWired and InControl are very promising options for the future, but right now I’ve got a legacy version of InControl, allowing support for non-standard controller setups. it’s a little unsatisfying to implement something that’s definitely meant for the scrap-heap, but the benefit is that we now have a build that has been sent to a few press folks, among others. that said, it was quite easy to get InControl running, but I’d love to know if anybody has experience with ReWired vs. InControl and what challenges both pose in the longer run. all of us have been in a little bit of a collective limbo recently given the marketing focus and it’s starting to feel a little like I haven’t actually worked on the game in itself for a long time – the upside of this is that I’m very excited to return to the more interesting problems! I feel like things could be a lot more life-filled. podes aren’t nearly as expressive as I’d like, and I think there’s a lot of room for hilarious squash and stretch given the current physics-driven limbs. adding some more nuanced face animations and generally fleshing out the movement capabilities is something to I’ll be treating myself to soon, I hope! for now, the aim is to get in touch with some streamers / youtubers since I think the game generally shines when you actually have people playing it. we always meant for it to be something to bring people together, and it’s simultaneously demanding and liberating to be making a game where the ethos is almost one of “make it fun enough so that people forget about the game for what it is, and appreciate each other’s company instead”. please do vote for us on Greenlight if you have the time and desire – the motivational boost of seeing a few more votes roll in cannot be understated! podes aren’t nearly as expressive as I’d like, and I think there’s a lot of room for hilarious squash and stretch given the current physics-driven limbs. adding some more nuanced face animations and generally fleshing out the movement capabilities is something to I’ll be treating myself to soon, I hope! Yassssss. And the different head shapes are adorable. after our initial announcement it seemed to me like we were off to a good start - the main factors here being featured on the new releases page for 2 days (by default), and traffic via twitter. however given that this wasn't followed by any press boosts or anything, after we dropped off that front page there was basically no direct traffic. which is totally expected, but also very easy to just feel stuck in as a result. 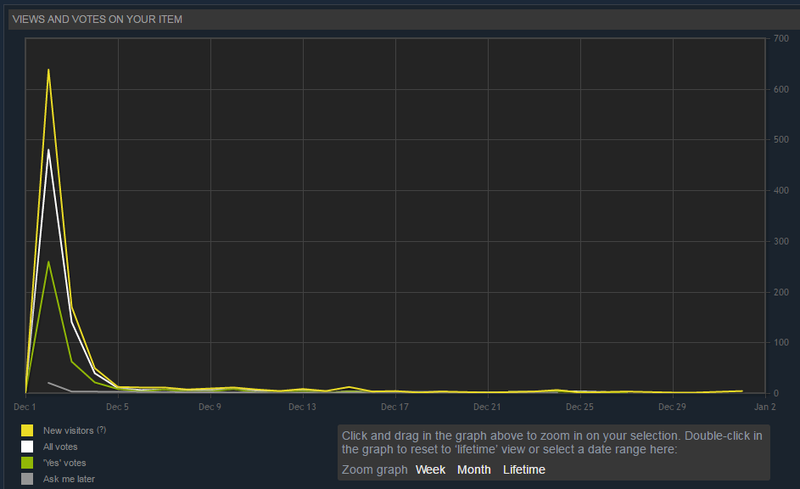 this was literally just a case of randomly receiving an email from steam notifying us, after several weeks of maybe 2-3 votes a day on average. it only really hit me that we'd basically prepared no 'promotional' material other than the campaign page itself after we'd made the campaign public. as a result I sort of hastily scrambled together some resources for press copies of our very non-intuitive build at the last minute. this seems simple to stay on top of in hindsight, but we just lost sight of what we needed in the excitement of just telling people about the thing. a good lesson for the future! Whoa! I was just playing Mario Kart with my little cousin on the Switch and got reminded of Muddledash! Haven't heard from you in a while, and there's been a pattern lately (it seems) with TIG logs going silent for a while then emerging to announce they're coming to the Switch. Is that what's going on? In any case I'd love to hear more! Congratulations on getting Greenlight! You give hope to us all! Hey thanks for checking in and thinking of us! Have a gif! Unfortunately I can't come back with any news about the Switch but it's definitely something that's been in the backs of our minds for awhile now and we're still planning on looking into it. Right now our focus is getting the game to a point where complete strangers can run through a full gameplay loop with no confusion or questions and no prompts from us. We're almost there but we really want it solid. Gotta apologise for the total lack of updates over here too, we've gone a little silent on all fronts lately as development as been slowed by general life stuff (Cop out excuse, I know) but we'll work through it!